The New Ikebana Movement in 1930’s changed ikebana significantly. 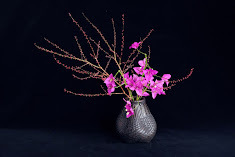 Ikebana came to be influenced by the Western Modernism Art Movement. How can we see ikebana today in the context of the international contemporary art? There are many topics to be considered. 1 What was the nature of Modernism Art Movement? When it came to Japan, why was the idea of Ikebana as spiritual training rejected? 2 How did the Modernism Movement change Ikebana? 3 The focus of contemporary art has moved from Modernism to Post Modernism. Should Ikebana keep focusing on the ideas of Modernism? Shouldn’t it shift its focus to Post Modernism? 4 Can Ikebana be a part of the Post Modernism art movement? Can we create contemporary art with ikebana? 5 Do we need to re-evaluate the traditional aspects of ikebana that were rejected by the New Ikebana Movement? How do ikebana practitioners with non-Japanese cultural backgrounds see the traditional aspects? My recent sculptural work, Whale’s Stomach was an attempt to answer question 4. It won the Arnold Bloch Leibler Prize 2017 at 17th Annual Yarra Valley Arts / Yering Station Sculpture Exhibition. It was a mixture of ikebana elements and non-ikebana elements. I was particularly conscious of the process of creation. Ikebana has taught me that there is a moment when a flower arrangement becomes a work of art. When I reach that point, my work starts to tell its own story. 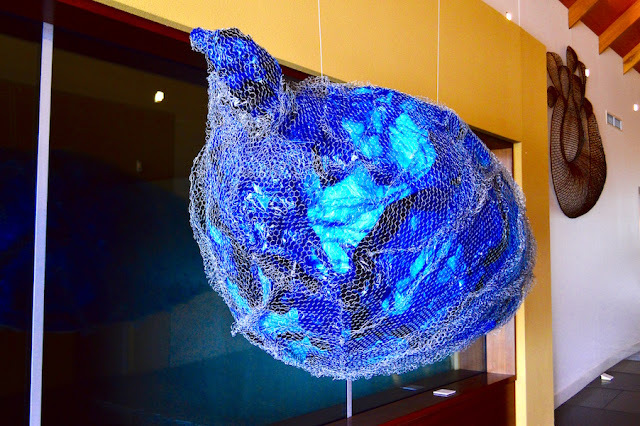 In making this work, I first made an object with various plastic bags. But the colours of the bags were so diverse that I had to cover the whole object with some large blue plastic wrapping sheets I found on a building site. The colour of the blue is so symbolic and effective. Only when you look closely do you notice the many plastic bags inside. The next step was to wrap the structure with chicken wire. But I was still not happy. When I took the surface of the chicken wire and created the wrinkles, I realised I'd reached the point where my work started to tell a story. I spent about 3 hours just before installation to create organic patterns on the surface. I’ll mention this work again sometime in a different context. In particular, this is a good example of the difference between ikebana and contemporary sculpture.